. . . the 90s ladies' jumpsuit! This entry, sent in by Anna, has earned the dubious title of Most Awesomely Bad Pattern EVER. It was the clear favorite for the win, taking a whopping 83% of your votes. Anna is also the seamstress whose question I last responded to in "Dear Gertie." As you may recall, she's an Air Force wife living in Norway without a sewing machine! 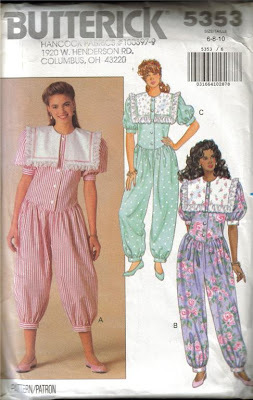 I hope her prize of a vintage pattern of her choice from Etsy will inspire her for when she's back up and sewing. P.S. Anna, e-mail me and we'll work out the details! Oh my. That is awful. My first thought was how on earth would you get out of it fast enough in the bathroom????? Just hideous! Back in the day, we called those "Clown Suits". I remember when 'Olivia' (Raven-Symone) wore those on "The Cosby Show". It was even awful on an adorable 4 year old. It looks like Little House on the Prairie avant-garde! Are they not pyjamas? I have difficulty believing that anyone, no matter how trendy in the early '90s, would wear this out of the house. Erica put it first and better - this is a design that is thoroughly even handed - it looks awful on everyone. Pollyanna. I can definitely see it on Pollyanna. My grandmother made those for my sisters and me. We were pretty young and cute, but we hated them becasue of the whole difficulty of bathroom trips problem. Hahah, a rightful heir to the throne of hideousness. You know where I got the idea? I'm pretty sure I saw it on "Full House" some time back in the day and just had to find the pattern to laugh at. Yes, I had a dozen or so of the dress version for wearing to church. I've never been so glad to grow out of something! That is TRULY vomitrocious! I had pants with that kind of yoke, and tops with that kind of collar, but putting all together in one hideous, hard-to-get-in-or-out-of piece is real genius. OMG! I had that. I wore it to the 8th grade dance. It was this gorgeous navy rayon. The bib was white with narrow ribbon around the edge (no lace). Oh dear god. I can't believe my mom let me out of the house in it. Much less that she went to so much expense and time on it. this totally cracked me up...sooo funny!!!!! Thanks! Gertie you should really make this!! Hilarious - I had friends who wore those! So glad I didn't! Oh .... I'm pretty sure my mom made me that awful jumper. It looks hauntingly familiar!